Using the NUK Baby Bottle Cleanser, it’s natural formula removes dried on milk protein, pulp, and juice residues more effectively than hot soapy water alone. *Assorted colours. Some parents prefer glass over plastic bottles because if looked after correctly they can be more durable. 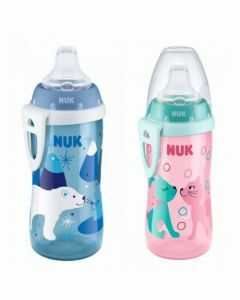 As with all NUK First Choice+ bottles, this bottle is designed to make the transition from breast to bottle feeding easier. Three sizes of feed hole available. Approved by the Oral Health Foundation.